Analysis: Brent spent time with the Bucs' and Colts' practice squads this season, but he was never elevated to the active roster. The third-year pro suited up in five games for the Colts last year, and he failed to haul in his only target. 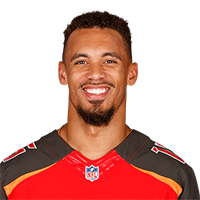 Brent will vie for a depth spot with the Bucs, who will likely be moving on from DeSean Jackson (Achilles) during the offseason. Analysis: The 25-year-old wideout spent time with the Colts' practice squad earlier this season, and he'd also worked out for the Packers in mid-November. With a solid 6-foot-3, 200-pound frame, the Bucs likely view Brent as an intriguing prospect that they'll hope to begin developing over the balance of the regular season and into the offseason. Analysis: Brent appears to have fully recovered from the knee injury that landed him on Indianapolis' injured reserve in September. If the 25-year-old is able to earn a depth role in Green Bay, he'd likely be relegated to special teams duty. Analysis: Brent was waived with an injury settlement from IR in September, but he joined the team's practice squad earlier this week. The Colts continue to battle injury issues at wide receiver, but the team opted to make room for Krishawn Hogan on the practice squad, instead. Analysis: Brent was waived/injured by the Colts back in early September, but will now return to the organization as a member of the practice squad. With injuries piling up on the Colts' active group, Brent could find himself on the 53-man roster at some point this year. Analysis: Brent suffered the knee injury in mid-August and was unable to play in the final two preseason games. The 25-year-old cleared waivers and was placed on injured reserve, but he can now sign with another team due to the injury settlement. Brent (knee) cleared waivers and reverted to injured reserve, according to the league's official transaction log. Analysis: Brent injured his knee in a mid-August practice and is now stuck on IR through the end of the league year, unless he agrees to an injury settlement. Brent (knee) was waived/injured by the Colts on Saturday, Stephen Holder of The Athletic Indiana reports. Analysis: Brent played well in camp prior to his knee injury but he wasn't able to get back to the field for the team's final two preseason tilts. If he goes unclaimed through the waiver process he'll revert to the Colts' injured reserve. Brent (knee) is not expected to play in Saturday's preseason game against the 49ers. Analysis: Brent suffered a knee injury Aug. 18 that has now held him out of the Colts' past two preseason games. The third-year receiver is squarely on the roster bubble, and is at great risk of not making Indianapolis' 53-man squad if he cannot get healthy and prove his ability. Look for Daurice Fountain and Cobi Hamilton to see additional looks if Brent is indeed out. Brent (knee) will not play in Monday's preseason game against the Ravens. Analysis: Brent sustained an unspecified knee injury during Saturday's practice session. The severity of the injury currently remains unknown, but it was enough hold him out of Monday's contest. Brent suffered a knee injury at Saturday's practice, Zak Keefer of The Indianapolis Star reports. Analysis: The severity of Brent's injury is unknown at this time. Expect an update on his condition once the Colts provide more information. Brent had two receptions for 18 yards on three targets in Thursday's preseason win at Seattle. Analysis: Brent has drawn praise in training camp for his performance and it looks like he has the inside track on winning a final spot on the roster as a reserve receiver. He got playing time with the second-team offense during the game, which shows he may have an outside shot at the No. 3 or No. 4 receiver role. Brent is listed as the No. 5 or No. 6 receiver on the Colts' first depth chart of the preseason, the Indianapolis Star reports. Analysis: It's notable that Brent is listed ahead of fifth-round draft pick Reece Fountain. However, that could be just because he's a veteran. Brent, an undrafted free agent from Wake Forest, played five games with the Colts last season but didn't have a reception and had just one target. He's a long shot to win a significant role this summer, but the No. 3 to No. 5 wide receiver roles are wide open. There are no videos available for K.J. Brent. Click here to view all videos.